Please refer to our stock # FI-11 A/B when inquiring. 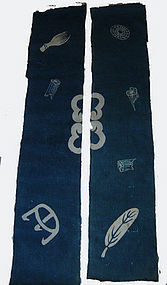 Two tsutsugaki (hand drawn rice paste resist indigo dyed) panels of (most likely) a 4-panel futon-ji (Bed Cover,) with design of various tea cermony implements, chadogu, used during the "ro" (hearth) season. These include tea whisk (chasen,) charcoal pieces, trivet for holding the water kettle, and feather for sweeping ash from the tatami. The center has the two sides of an unknown family crest of floral design. Japan, ca. mid-late 19th C. The textiles have a paper backing indicating they were probably mounted for display at one time. The piece could also possibly be a "yutan" (covering cloth) or "furoshiki" (wrapping cloth.) (A)Left - L.60"(153cm) x W.12"(30.5cm.) (B)Right - L.58"(147.5cm) x W.11.75"(30cm.) A similar, full futon-ji with tea implements was on display at the Fowler Museum at UCLA 2009 exhibition, "Steeped in History: The Art of Tea." Tsutsugaki dying involves creating a rice paste resist which is dispensed through a cone-shaped piping bag (tsutsu) by hand to create the design or image. After indigo dying is completed, the paste is washed off. Being free hand, tsutsugaki desgins tend to more expressive and lively than katazome (stencil) dyed works. Futon-ji were typical items given as bridal dowries although similar pieces such as "yutan" covering cloths were used to cover dowry items during wedding processions and for storage of valuable items. They were custom-made and commissioned from indigo dye craftsmen for special occasions. These pieces could be mounted again as a scroll to display a unique piece of beautiful mingei craftwork during the hearth season, or anytime.